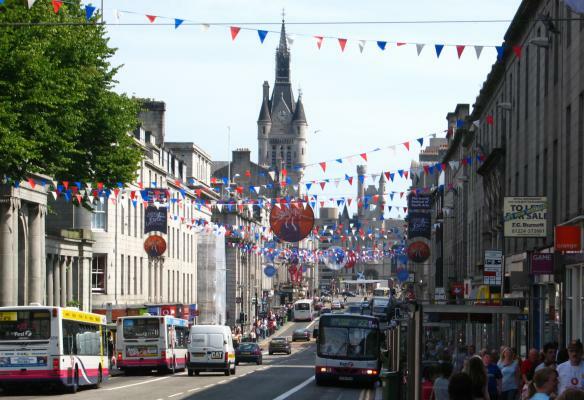 Aberdeen High Street @ High.St - High Street shops and High St businesses. 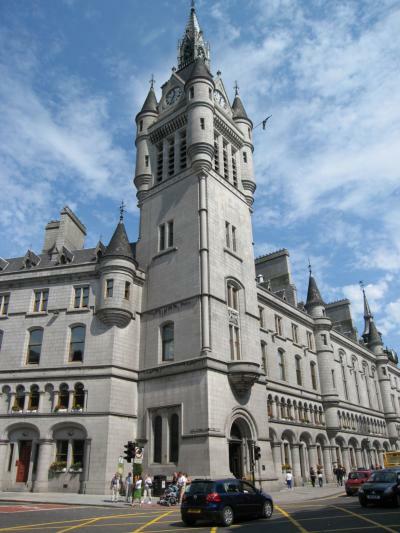 Picture above is of Union Street Large Google map of Aberdeen High St.
Aberdeen is known as the Granite City and gives the buildings a sparkle of colour in sun and rain. Aberdeen Harbour dates back to 1136 and is Britain's oldest company. Today, alongside the old fishing village of Footdee are the modern facilities of the oil and gas industry. This bustling city sits comfortably alongside a wonderfully long stretch of golden sands where it is hard to imagine being so close to the city. The Beach is also home to Cadona's, a permanent amusement park, and Sunset Boulevard, an indoor family entertainment centre. 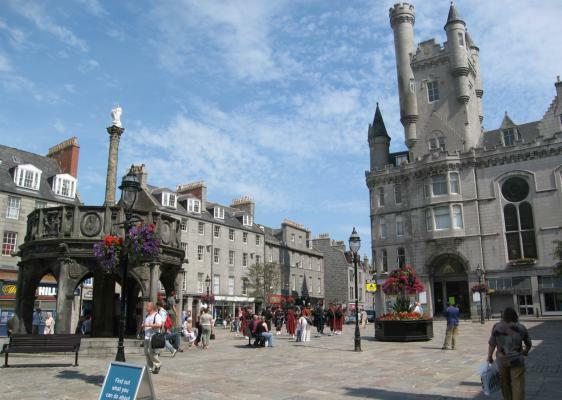 Aberdeen High Street is in the old town, an area that was established in 1495 and for the last 500 years has been part of the Aberdeen University campus. The Old Town House sits at the head of the High St and when it was built in 1788 was the hub of the Burgh and local trading. Now the majority of shops are located along Union St and in the Bon-Accord, St Nicholas and Trinity arcades. It is these areas we show below. We recommend the La Lombarda Italian restaurant in Castlegate. This restaurant was established in 1922 and is the oldest Italian restaurant in Britain; what's more, until 1998 it was owned by the same family! Detailed maps and information from RPA Smith Street Maps web site.